The arrival of Batman V Superman: Dawn of Justice may have been brief, but it dropped enough bombs to keep fans happy. 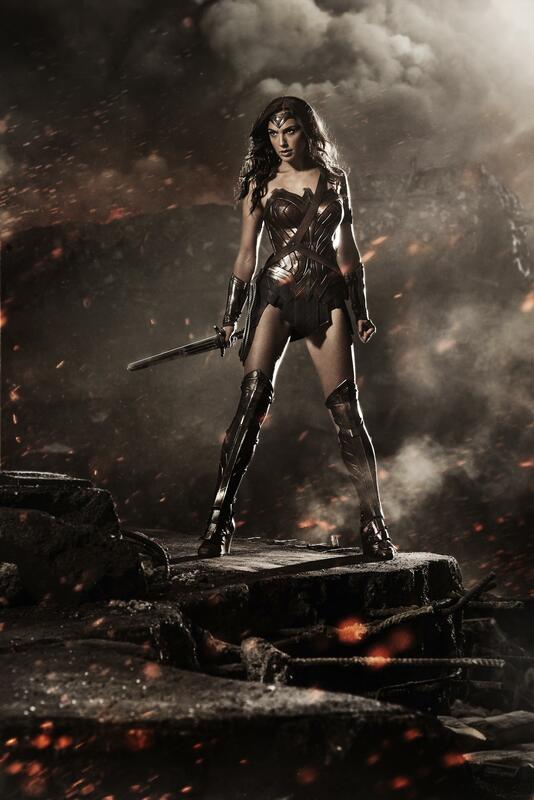 After debuting the first footage of Batman and Superman in the film, the audience was given its first look at the costume design for Gal Gadot's Wonder Woman. It won't be too much of a surprise for comic book fans, but to say it's been a long-awaited reveal would be an understatement. All things considered, the costume is essentially what has been expected from the beginning. Staying true to the 'Amazonian warrior' roots of the character, the costume is a blend of battle armor and classical Greek style. The 'W'-shaped metal eagle is alive and well atop a corset of leather and metal, with the other key features of the costume that have stayed consistent in nearly every incarnation. For an even larger version of the photo, head here. First things first: the aspects of the character's design which may have straddled the line between believable and camp have turned out surprisingly well. The battle-tiara worn by Wonder Woman since the very beginning remains, as do her bullet-deflecting bracers and the braided lasso on her hip (although we wouldn't hold our breath that it will possess the same magical abilities as seen in the comics). Of course, the costume is still sure to have its critics; skirt length is clearly not a concern for Diana when standing in the middle of a destroyed urban center (despite the fact that she's still showing less than a female Transformers star), and the effectiveness of her footwear - which, let's get straight, are wedges, not heels - in combat is questionable. Yet Snyder has also decided to tone down the costume much like he did with Man of Steel, applying a bronze glaze to the entire wardrobe instead of the bright primary colors of the comic book version. Add in the leather straps which presumably hold the Amazonian princess' shield on her back, and the costume could best be described as grounded for Warner Bros.' growing DC movie universe, but still a faithful recreation of the source material (as is the case with Ben Affleck's Batsuit). The reveal won't quiet all the concerns over Wonder Woman's arrival to the big screen, but it certainly shows she's being given the same level of treatment as DC's other two heavyweights. What do you think of the final design? Does it seem like the perfect way of bringing Wonder Woman into the world established by Man of Steel, or were you hoping for a difference direction? Sound off in the comments. Batman V Superman: Dawn of Justice is scheduled to hit theaters on May 6th, 2016. Follow me on Twitter @andrew_dyce for updates on Wonder Woman as well as movie, TV, and gaming news.